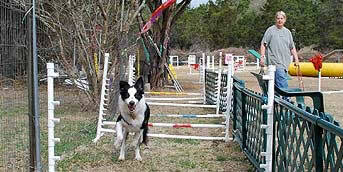 Agility is a popular dog sport where the handler directs the dog through a variety of obstacles. It’s great physical and mental exercise for dogs and fun for handlers. 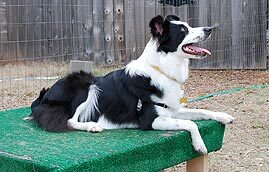 It is excellent for confidence building which can be carried into any kind of competition -- Becky’s clients also compete in obedience trials, conformation, lure coursing, field tests, tracking, herding and search and rescue. 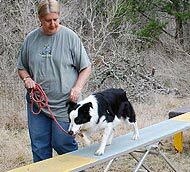 Becky has experience working with many non-traditional Agility dogs, everything from Bloodhounds to Chihuahuas. Classes are taught south west of Austin. There are both morning and evening weekday classes. There are ongoing classes at levels from Intermediate through Competition. Beginning classes are offered two to three times a year, usually in the fall, winter and/or spring. The Beginning class is an eight week class meeting for an hour per week. The class is $160. Private agility lessons are also available. and start at $70 an hour. Click here to see a schedule of all classes. Reminder: Please be considerate of our neighbors and keep your dogs as quiet as possible when you’re out using the field. If your dog is noisy while you’re setting up an exercise, please put them in the car until you’re ready to practice. Both Behavior Counseling and Pet Obedience are done through in-home private lessions tailored for the individual dog and owner’s needs. This is an excellent way to work on anything from leash walking and recalls to jumping up, destructive behavior or fear aggression. Becky teaches you how to work with your dog so you can be successful. She also has experience in working with dogs and kids, new dog adjustments, and working with puppies. In addition to working on any existing behavior problems, you can also work on prevention and general behavior management. Click here to read the field’s rules and policies. Click here to learn all about the field.